First halal food is Cheburek. This food was once became ‘king of fast food Russia’. Its even beating foreign popular foods like hamburgers and kebabs. 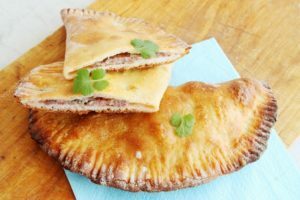 This dry cake is stuffed with goat meat or calves. That are minced softly mixed with broth, then fried with butter. Echpochmak is also called ‘triangle’. This is the first food you should try to get to know local dishes. This food looks very simple: fermented dough, meat, onions, potato dice, pyramid-shaped and baked in the oven. 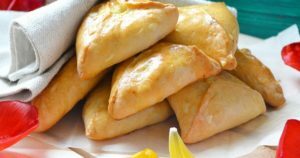 The classic Echpochmak is flavorful and remains warm for several hours. Echpochmak is filled with different meat. The best combination is beef mixed with duck meat. While goat meat mixed goose meat. When the cake is nearly cooked, give a drop of broth or a piece of butter into a special hole at the top of the pyramid. It can strengthen the flavor of the echpochmak. 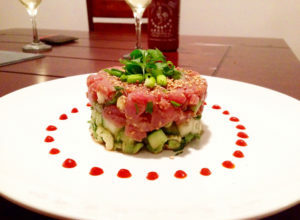 Tartare is a large serving of raw minced beef. Its mixed with egg yolk and a delicious marinade sauce. Steak Tartare is derived from steak a la tartare. This food was originally served with tartar sauce. Tartar sauce is a mayo sauce and pickle cucumber that is usually present when we eat Fish n Chips. Meat sliced small lengthwise, before mixed with other main ingredients. Beshbarmak is boiled meat. Usually chopped with a knife. Often mixed with boiled noodles and seasoned with onion sauce. These foods are usually served in large round bowls. Beshbarmak is a national dish of Kyrgyzstan. However, this food is very popular in Russia. This dish is made from horse meat, and sometimes lamb or beef. Beshbamark is boiled in his own caldin for several hours. Then served on top of noodles then sprinkled with parsley and cilantro. Beshbarmak means “Five Finger” in Kyrgyz. Because this dish is eaten by hand, without spoons and forks. Beshbarmak is most often made during birthday parties, new birthdays, birthdays, or the occurrence of death in the family. Whether it’s a funeral or an annual celebration. This food include one of the halal foods in Russia. Chak-chak is made from a mixture of flour and water without yeast. This dough is rolled into a ball the size of a pecan fruit. Then fried with lots of oil. 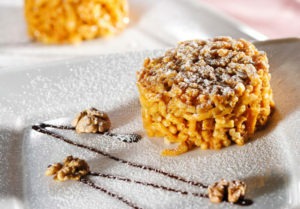 Although at first glance looks like macaroni, but apparently chak-chak is made from meringue. Meringue is a white dough from egg whisk. The meringue will then be elongated and then fried in hot oil. Once browned, chak-chak will be smeared with melted honey to sticky. Chak-chak will be more delicious eaten in a cold way. 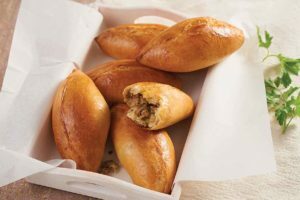 Gubaidiya is one of the halal foods in Russia that every muslims must know. This food usually for the wedding guest. This food consists of layers of meat, rice, chopped eggs, raisins, and dry white cheese. Gudabadiya is the same as the gubaidia of the Tatar Volga. 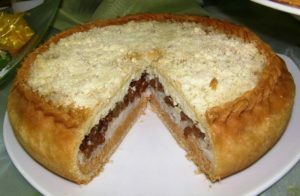 The top Pastor of Tatar is gubaidia, a meat-made pastry, which adorns the Tatar table in a special feast day. This delicious soup have bright red color. Borsch is eaten with bread and sour cream. The red color comes from fruits that are cooked with vegetables and meat. Used vegetables usually, cabbage, carrots, beets and other vegetables. In some other countries the red color in can be from tomatoes. 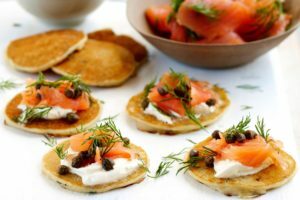 Ancient Slavs used blini for food offerings in their pagan rites. Blini fits as a round, warm, and golden symbol of the sun. The newborn woman is fed a blini. This meal is also served at weddings and funerals. The Russians now make blini instead of wheat flour alone. Other types of flour can also be used. Frying blini is considered art because every blini should be as thin as possible. This dish is a form of Shish kebab. 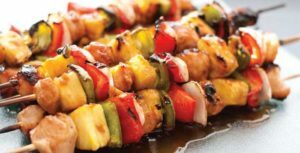 Shashlik is grilled meat and fish on skewers that you should try. Surely you will be addicted. 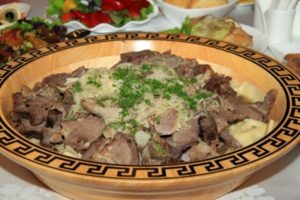 As the name suggests, this dish is a form of shish kebab, although the Russian version is served with a chunkier portion of lamb, beef, chicken or salmon. You can easy to find out this foods in Russia. Its more like snack in Russia. These little pies are sold everywhere in the country. Usually in small cafeterias and shops. The contents vary widely. Among other things meat, fish, and eggs to vegetables and fruits. The beef stroganoff is a typical Russian beef dish. That is the beef is pan-fried and then served in a sauce with smetana (sour cream). From its origins in Russia in the mid-19th century, this dish has been popular all over the world. 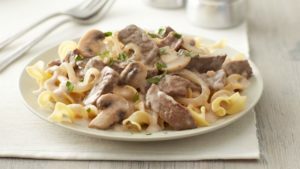 Now stroganoff has considerable variation from the original recipe. That’s all some halal foods in Russia that every muslim tourist must know. So for you who want to go to Russia, don’t worry to have halal foods in this superpower country. See also popular foods in St. Petersburg during Ramadan and what drinks that can enjoyed by muslim during Ramadan in Moscow.